During the early years of the Spanish Republic the communist party in Spain had only a few thousands members. It was an insignificant political force. Spanish fascism, or Falangism, was equally unimportant on the national scene. But both groups carried a loaded pistol. When the shooting began, the Spanish people, who were caught in the middle, were forced into taking a position at one of the two extremes. The generals eventually won a hard victory, and fascism emerged triumphant. After their victory at the polls the liberals, under Azaña, formed their new government, and it is stated that there was not one communist in it, not one socialist, not one extremist. This Republican government of Azaña was the one against which Franco rebelled. It is the government that Hitler and Mussolini referred to as “Red.” This was given as the reason for their intervention in Spain. Both fascist leaders were anxious to make Spain become “the tomb of Bolshevism.” General Franco’s habit of calling all the Republicans “Reds” assured him of aid in quantity from Germany and Italy. In fact the war was far more than a mere struggle between two factions within Spain. It was an international war in which Germany, Italy, Russia all participated in greater or less degrees, using Spain as the battlefield and testing ground for their arms and the propaganda. The Spanish civil war was the rehearsal for World War II. The Republicans received token supplies from France, but Britain and the United States observed a complete “hands-off” policy. Aid reaching the Republicans was considerably little, and the main part of it came into Spain from the Soviet Union. The Russians very plainly wanted Republican Spain to establish a dictatorship of the proletariat which would result in placing the communists in power. In order to achieve this it was first necessary to win the civil war, but in fighting the war every possible effort was made to push communists or, better still, communist sympathizers, into position of power. The communist leaders did not hesitated to use the most ruthless methods against those who opposed them. This campaign became successful toward the end of the war in spite of the opposition of the majority of the Republicans, for they needed all the help they could get, and were willing to endure many indignities in order to receive it. The Soviet Union was the only nation which offered help, so was the only nation which was in position to exert any strong pressure on the Spanish Republic. The rightist struck on July 17, 1936 with the revolt of the army of Morocco. It was reported that the elements supporting the military rebellion were: the monarchists; the big landowners, who wished to continue feudalistic agriculture; the industrialists and financiers; the hierarchy of the church; the fascists, headed by José Antonio Primo de Rivera, son of the former dictator in Spain; and the military. The forces of General Franco irrupted from the south, as had the Moors in centuries gone by, and quickly swept across the southern plains and mountains toward Castile. There were fierce pockets of resistance in the cities of Andalusia, but these were eventually wiped out. 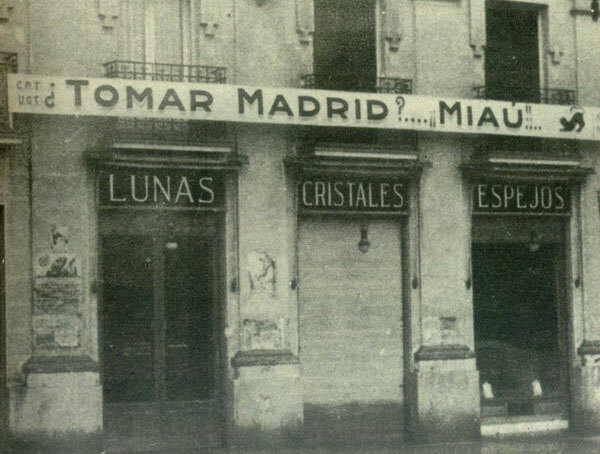 The invading army was soon within gunshot of Madrid, the Republican capital. Here it met the main force of the Republican army, and was slowed to a walk. Finally, the decision was made to besiege the city, and for the following three years the two armies faced each other at the outskirts of the capital, in the vicinity of the present University City campus. Here many a bloody battle ensued, but the besieging forces were unable to enter Madrid, which they bombarded unceasingly. Other sectors of strong Republican resistance were in the Basque and Asturian provinces, in Valencia, and in Catalonia, especially in Barcelona. The Basques and Catalans were fighting for self-government, as much as for the Republic. The Basque group constituted the religious and conservative element on the republican side. Not by any stretch of the imagination could these Basques, who had struggled so long against the central government in their Carlist wars, be called liberals or leftists. In Barcelona, on the other hand, thousands of Republicans were out-and-out anarchists, who were more interested in imposing their syndicate-style local governments than they were in winning the war against general Franco. The Communists, on the other hand, were all for winning the war first, and discussing a division of the spoils later. The Spanish Republicans called themselves “Loyalists,” because they were loyal to the Republic, but General Franco’s side invariably called them “Reds.” On the other hand, the Republicans referred to Franco supporters as “Fascists,” or as “Rebels,” while they called themselves “Nationalists.” The Spanish civil war was a war of words, as well as a war of ideas, of gunpowder and of steel. The Loyalists went on a rampage killing priests, nuns, and all others thought to be Franco sympathizers. The Nationalists as they advanced picked out those who had supported the Republic in each of the regions and towns which fell into their hands, stood them against the walls and shot them. About 100,000 Spaniards were killed in these brutal reprisals. The military uprising, wrongly termed “national uprising” by Franco and his supporters, for it was certainly far from being national, was mainly inspired by the old-line conservative tradition of absolutism. The generals who were Franco’s companions-in-arms all hated the Republic because it was liberal and because it was weak, too weak to prevent disorder. These generals had no political or social program to offer. They did not claim that they were revolting in order to save Spain from communism. This was a cry raised later, mainly for purposes of propaganda. In his initial manifesto General Franco did not even mention communism. What he hated was the Republic. The Republic, for its part, did not at first regard the military rebellion as a full-fledged fascist revolt, which indeed was not, for the majority of the Spanish rightists did not favor any such uprising. Almost the entire army, navy, and air force joined the generals. The Civil Guard Corps also threw its considerable weight over to their side. The Republic was left almost without soldiers to defend it. A few assault guards and some military groups were loyal, but these could not compare in number with those under General Franco. The general also almost immediately received numerous German and Italian planes to transport his troops, and these were soon joined by large contingents from the Italian and German armies. The Italians sent four full and heavily armed divisions to fight in Spain, and the Germans a sizable air force and several thousand ground troops. The main body of the Republican army was composed of Spaniards who fought with the tenacity and the bravery for which the race has always been noted. But for Russia, which helped the Communists sending them arms, no other country stood in favor for the Republic. At that time everyone was deathly afraid of Hitler, and sincere but misguided people of all over the world were unwilling to send arms to any other country lest their own nation become inadvertently embroiled in a war. However, on March 26, 1939, the war was ended and the Republican army was allowed to disband. The Spanish Loyalists may have lost the war because friendly nations refused to sell their government the necessary munitions, but the Republic itself had already fallen apart because its national parliament was unable to govern. The Republican leaders were nearly all well-meaning men, sincere, idealistic, honest, dedicated, and impassioned. But they did not know how to govern. They were unwilling to compromise. They allow personal animus to disrupt the procedures of the Cortes. Azaña, Lerroux, Gil Robles, Largo Caballero, and all the others were educated men who should have learned that successful government consists mainly of the art of the possible. But these leaders were Spanish to the core. They came at the end of a tradition absolutism in government, of inquisition in religion, of military supremacy over the civil authorities. Their failure proved again that in Spain the country must go one of the two ways: either split up into regional fragments, or submit to a powerful central government, for in Spain only the strongest possible central authority can successfully impose itself over the age-old yearning for fragmentation. There is no doubt that the Spanish people themselves, as their history for centuries past bears witness, have continued to reflect these same tendencies in all that has taken place in Spain since the advent of the Second Republic. The Spanish civil war was one of the cruelest struggles in history. Any civil war is bound to be divisive, but one which is fought along ideological lines divides the country right down the middle, family from family, brother from brother, father from son, friend from friend; it causes splits and hatred in the basic fabric of family and community life which are not healed for many generation. Add to this the passionate and quickly stirred nature of the Spanish temperament, and you have the makings of a full-fledged blood bath of the most horrible kind. This is exactly what happened in Spain. The physical and moral destruction caused in Spain by the civil war was tremendous. It is estimated that about 320,000 men died in action, perhaps 220,000 died of disease or malnutrition, and at least 100,000 were executed or murdered. After the war a total of at least two million persons were imprisoned for varying periods of time in Franco jails. One of the most sorrowful outcomes of the civil war was the abandonment of liberal principles by many of the intellectuals and the exile of hundreds of others. Thousands of liberals fled from Spain in order to escape from Franco’s new church-state. Almost the entire publishing industry left, along with the best writers, university professors, artists, and scientists. The loss of these men to Spain has been irreparable. The Spanish masses were left headless and invertebrate for a generation; without intellectual leadership the popular will is a chaotic mess or a submissive lamb. It has been both under the regime of General Franco.